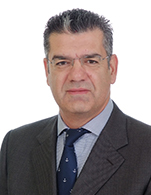 Since 1988 he works in the Shipping sector of the Onassis Group, where he served in various positions. He was born and raised in Athens. He is a graduate of Lycee Leonin High School and holds a BSc in Mathematics from the University of Athens, a BSc in Business Administration from the University of Piraeus. He completed his post-graduate studies in London; he earned a MSc in Management Science from the Imperial College. Member of INTERTANKO Council and Vice-Chairman of the Intertanko Mediterranean Panel, Member of the DNV, NK and KR Greek Committee and Fellow Member of ICS (Institute of Chartered Shipbrokers).